My 1983 Jeep J10 water pump seals failed fairly quickly after being dry and unused for nearly two decades. There is a small weep hole at the bottom of the pump shaft housing that started gushing. The solution is to replace the entire water pump. New pumps are not expensive but replacing them is a pain. 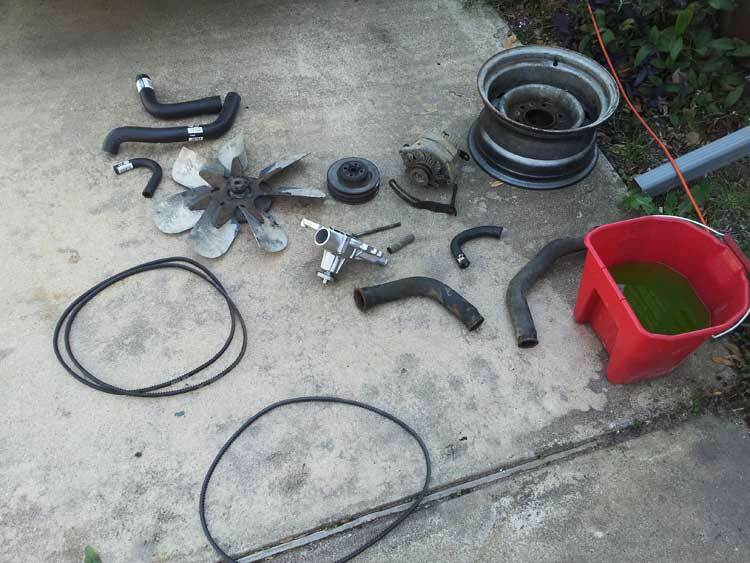 The mechanical fan, radiator, A/C compressor, alternator, power steering pump (and air pump if you still have the emissions control stuff) all have to be taken out in order to replace the water pump. Performing this step actually provides a good opportunity to clean up the front of the engine, clean and repaint various components, replace all rubber hoses and belts, and replace the fan clutch. Most of the disassembly was straight forward and self explanatory. The worst part for me was removing the 4 long bolts that mounts the water pump to the engine block. Coolant had seeped to the bolts and caused rust so they were nearly impossible to remove and required a breaker bar, crowbar, lots of elbow grease and nearly 1 hour of work per bolt. I used a wire wheel to grind the rust off the bolts once they were removed and then generously applied anti-seize lubricant before reinstalling the bolts with the new pump. The other annoying problem was a couple of the smaller bolts around the water pump perimeter had rusted bad enough that the bolts snapped. Such a nightmare. Fortunately, using penetrating oil and a dremel to cut a small notch in the end of the snapped bolt shaft worked to loosen and remove the remaining ones. I used stainless steel bolts to replace the smaller ones so this problem would never happen again. Several points below on the cooling system to ensure it runs optimally and yes, there are a lot of things that can go wrong and affect the cooling! Radiator: Make sure the radiator has been flushed and is clean. Mine drained with a noticable amount of rust and brown residue. Vinegar is a good inexpensive solution for cleaning rust and ensure the radiator passages are open. You could fill the entire cooling system with vinegar and let it sit for 24 hours, then run engine until it warms up then stop and drain the radiator. Thermostat: The stock thermostat is 195 degrees Fahrenheit, which means it starts opening around 195 and is usually fully open 40 degrees above that for maximum coolant flow. Some people run a 180 degree thermostat to lower the operating temperature and ensure that the engine doesn't get beyond 220 degrees rather than 240 with the stock thermostat, but this doesn't necessarily solve overheating problems if the engine tends to heat up past 240 degrees. Be careful what water pump is selected because high flow water pumps are known to cause problems when used in conjunction with standard flow thermostats. The high flow causes the thermostat to react too quickly and creates an oscillating open and shut behavior rather than regulating at a steady temperature. If you decide to use a high flow water pump then probably will need to consider replacing the thermostat with a high flow type designed to work with the water pump. I do not have any personal experience with this but I think it is useful to mention the general information that I have gathered from reading forums. Also be aware of failure symptoms for thermostats. A stuck open thermostat will prevent the engine from warming up quickly or attain normal operating temperature. A stuck closed thermostat will cause the engine to overheat quickly and you shouldn't drive around with this issue. Water pump: I used a standard stock water pump replacement for my FSJs. I don't do any towing with the rigs. As stated earlier with thermostats, be aware of possible implications with choosing a high flow water pump. Fan clutch: Here in Texas, I prefer to replace the standard or heavy duty fan clutch with an extreme duty fan clutch to maximize the fan speed without going electric and upgrading the alternator to support the additional power draw. 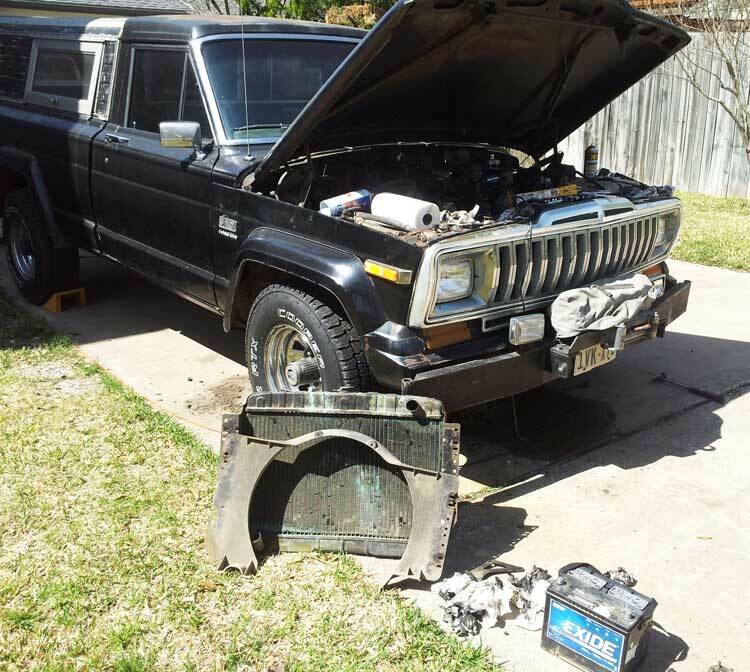 The Hayden 2797 clutch is an excellent choice that has worked well for me on the Wagoneer and J10. The only downside is the mount holes do not align with the stock holes, but that can be easily remedied with an angle grinder or dremel to cut the holes into notches. Temperature sender: Don't assume the sender is accurate in the first place. I've experienced failed or flaky temperature senders on both of my FSJs. 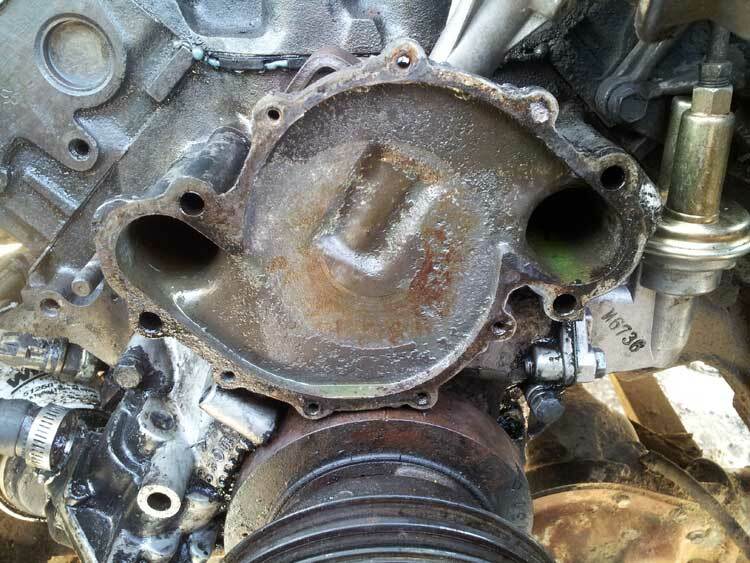 The sender is located near the distributor on the engine manifold as shown in the following picture. With a multimeter, the resistance of the sender from the top connection to the engine body ground should be about 73 ohms cold, 36 ohms is start of green band and 13 ohms at the end of the green band. The older gauges had no actual temperature markings but my guess is the start of the green band is 200 degrees, middle is 220 and end of range is around 240 before entering the red zone. The original sender in the J10 seemed to work but the in-dash gauge reading was off by a good 20 degrees and was sometimes erratic. The multimeter read open resistance on the sender, but if you passed some current with 12V potential then the sender would suddenly have some resistance and drift back to open. I don't know if senders can fail shorted, but if the gauge reads in the hot range immediately even with the engine cold then either the sender or some spot on the wire has shorted to ground. In any case, replacing the sender is very inexpensive and you should do it anyway if you're suspicious of the gauge. The stock gauges are reasonably acceptable once all the issues are straightened out. There is no need to install an aftermarket gauge unless you just want to upgrade to something much more reliable. Temperature gauge: This is the thingmajig in the dash that tells you if the engine is running at optimal temperature or about to melt down so you definitely want to make sure it is accurate! These old analog gauges rely on a little bimetallic strip with a coil of wire around the strip that heats up depending on the current flowing through it. The strip bends its shape when heated up and moves the gauge pointer. When the resistance of the sender lowers as engine temperature goes up, the strip heats up more and moves the gauge from one end to the other. On top of that, there is a second bimetallic strip inside the temperature gauge that acts as a pretty crude bang-bang voltage regulator to reduce 12V to about 5V for all the gauges in the dash. If none of your gauges work then this regulator has failed most likely due to a burned out coil. Some people have recommended replacing the regulator with a solid-state DC regulator such as a 7805, but it has some noteworthy downsides and problems. The first problem is the 7805 will literally output exactly 5V so at start up, all the gauges will be slow to respond and settle to the correct indication on the order of 10-20 seconds. When using the original built-in bang-bang regulator, all gauges move more rapidly and settle to the correct position within a couple seconds. The second and very important downside is the coolant temperature gauge tended to move towards overheating despite an IR temperature gun on the radiator showing perfect 195-200 degrees. Sometimes the gauge will start acting erratically with no correlation to reality whatsoever. Replacing the gauge and ditching the 7805 regulator in favor of a NOS replacement fixed this problem! Carburetor: Make sure the carburetor is tuned up for correct fuel-air mix delivery. Look up some pictures online for reading spark plugs. They do come in handy and you want to see some hint of gray on the white ceramic center of the plugs. 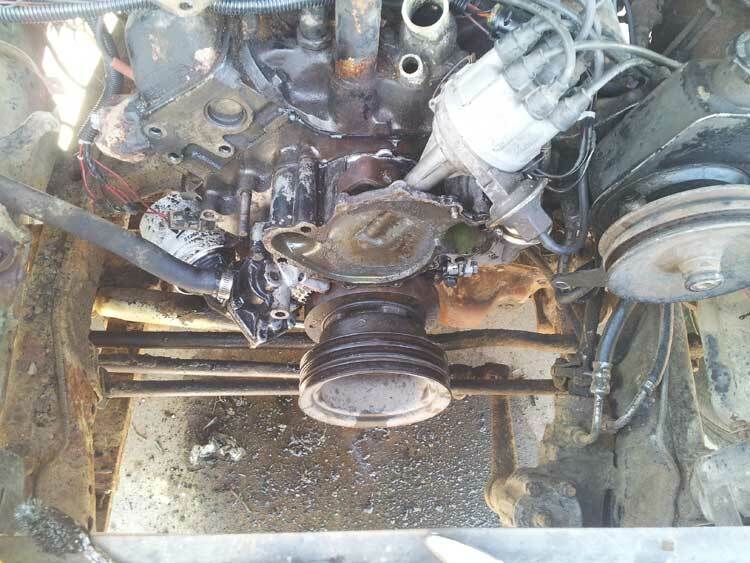 I was seeing shiny white plugs on my J10 so the engine was running very lean and that contributes to running hot. I had a lot of problems with vacuum leaks in my FSJs causing the engine to run very lean. On the J10, the PCV valve happened to be missing! Other symptoms of vacuum leaks are rough idle and difficulty tuning the base idle below 1000 RPM for the 360 V8. Rebuilding the carburetor is probably a good idea if you suspect issues with it. It also provides the opportunity to verify the jets are sized properly for the engine. My J10 has the stock size 55 jets that determines the fuel mix during cruising. 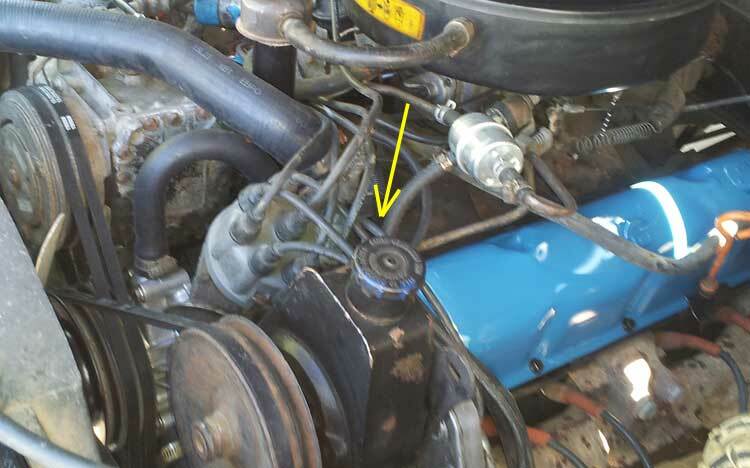 The two idle mix screws on the carburetor only determine the fuel air mix at idle. Fan shrould: FSJs with the 360 V8 definitely should have a fan shroud to ensure cooling at idle with the A/C. The shroud doesn't really help a whole lot for highway driving. You can make your own fan shroud based on my notes here.